NOTE: This article first appeared in the Summer 2017 issue of The Trackside Photographer. In 1967 young people were told that plastics were the future and the future did not disappoint. Today the world is made out of plastic, carbon fibre, corrosion resistant lightweight alloys, high strength concrete and LEDs. This technology has generally converted our world from one where stuff is expensive and people are cheap, to exactly the opposite. I could go on and on about the many economic ramifications of this, but in essence "things" went from being crafted and artisan, to being so invisible that they might as well not matter. Back in the day the Pennsylvania Railroad was the largest private employer in North America with over 300,000 employees, roughly the same as WalMart. This vast army of workers was needed to polish, paint, lubricate and generally maintain all of the expensive, labor intensive technology that allowed humans to move at speeds faster than brisk walk. Replacing the materials of old was part and parcel to being able to replace the workers that cared for them, however as we charge into the middle of the 21st century some of these materials have soldiered on in the service of railroad signaling and, until their inevitable replacement, they provide a window into the pre-digital industrial age. 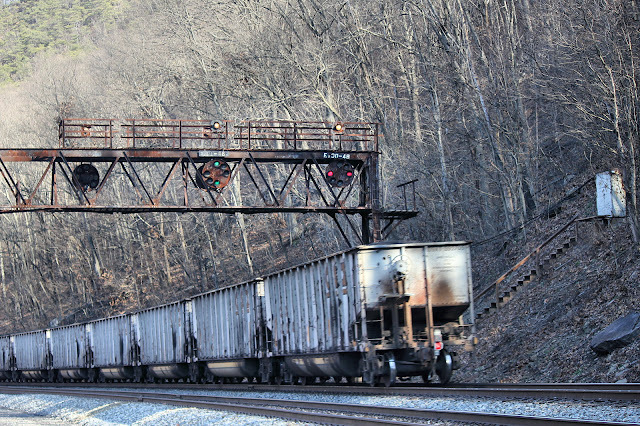 Steel and iron are the stereotypical railroad materials as demand for bridges, rails and locomotives practically created the modern steel industry. Of course steel wasn't just used for girders and boilers. Back in the day this was the only metal one had available for structural components of any size and before the advent of plastic or other composites, metal was one of the only materials available with an adequate strength to weight ratio. 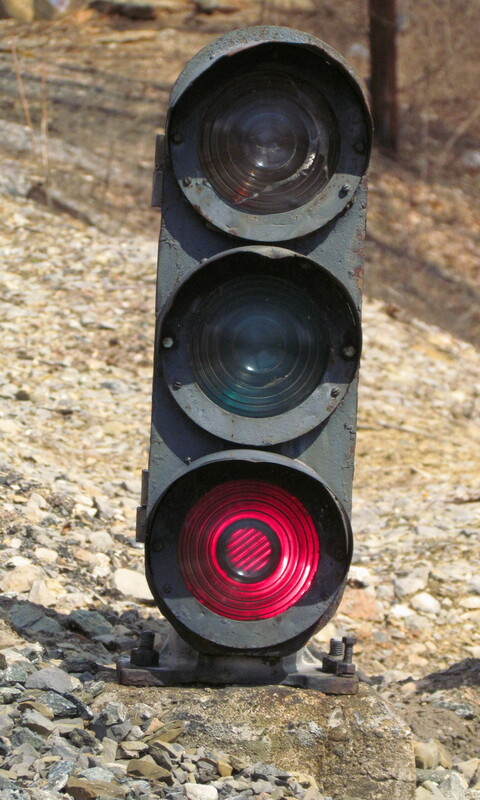 Stronger, weather proof and more durable than wood, iron and steel became the materials of choice ofr railroad signals and signal structures. 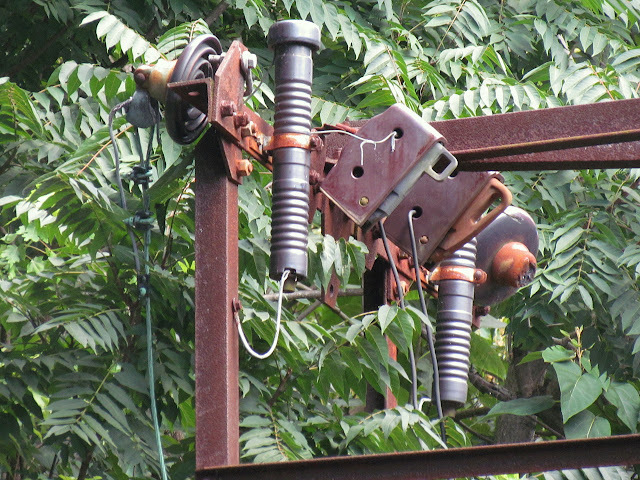 This US&S style N color light signal mast shown above is almost completely made of iron and steel, right down to the base. Cast iron housing and brackets, sheet steel backing, steel pipe mast, strap iron ladder work, heck, even the signal wires are sheathed in iron. CSX Philly Sub - MP 80 Auto Signal "Whitemarsh"
Cheap and easy to stamp, cut, forge or cast, steel was everywhere, but it's suffers from a major weakness against air and water. The scourge of rust requires care and paint, and paint requires workers to apply and remove. In the 21st century aluminum is cheap and plentiful. 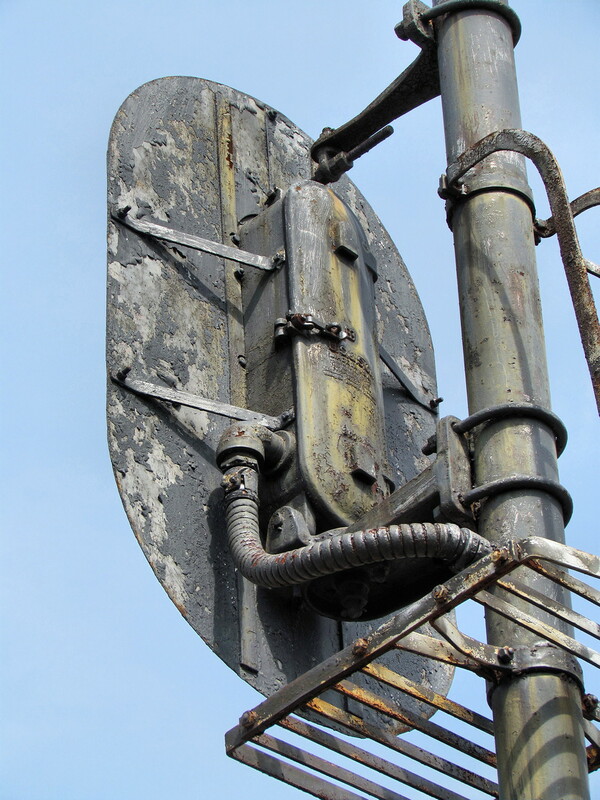 Lightweight and rust free, any signal made of aluminum will look as good on the day it is installed as the day it is removed perhaps decades in the future without needing so much as a man hour of skilled labour. Also used for bridges and track structure, wood was the plastic of its day. Light and easy to shape, it also has tensile strength allowing it to span distances in a way that stone or concrete cannot. 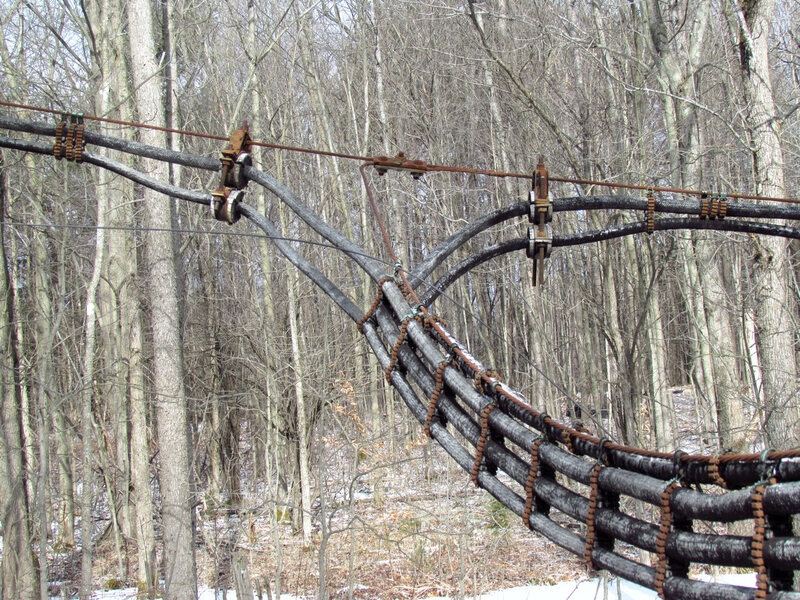 Although it was excluded from most signal structures, wood was employed in pole lines to support the signaling and telegraph wires that carried little bits of voltage from one signal location to the next. Unlike steel, stuff can be easily attached to wood with nails or screws and, somewhat surprisingly, wooden poles can also last decades after being impregnated with petrochemical tars. 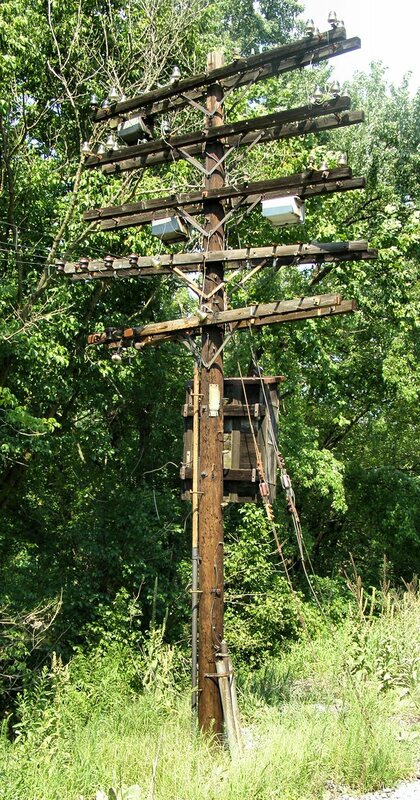 However modern technology found other ways to eliminate the wooden pole lines by replacing the wires they carried with fiber optics or wireless signals. Surprisingly, cotton was an important material in railroad signaling. 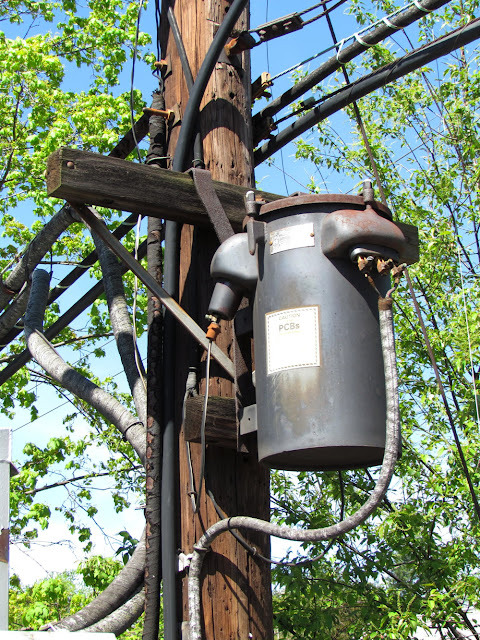 Before the advent of PVC sheath insulation, large signal cables were wrapped in cotton impregnated with tar to keep out the elements. 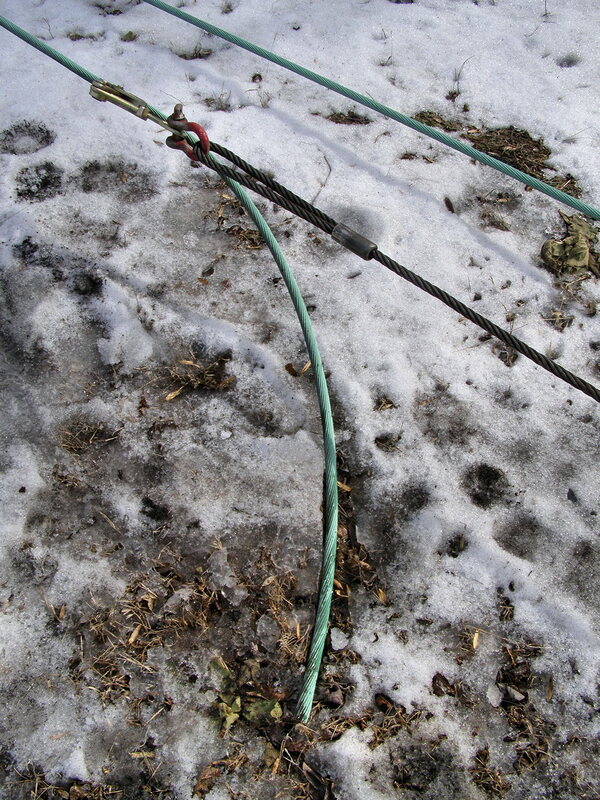 Cotton insulated cables went hand in hand with the pole line concept as attempting to bury such a cable would quickly lead to its failure. Damage vulnerable to wind, snow, rain and trees, this was accepted a cost of doing business. From the smallest telegraph wire to the thickest high voltage transmission cable, copper carried the electrons that powered the signals and sent the data. 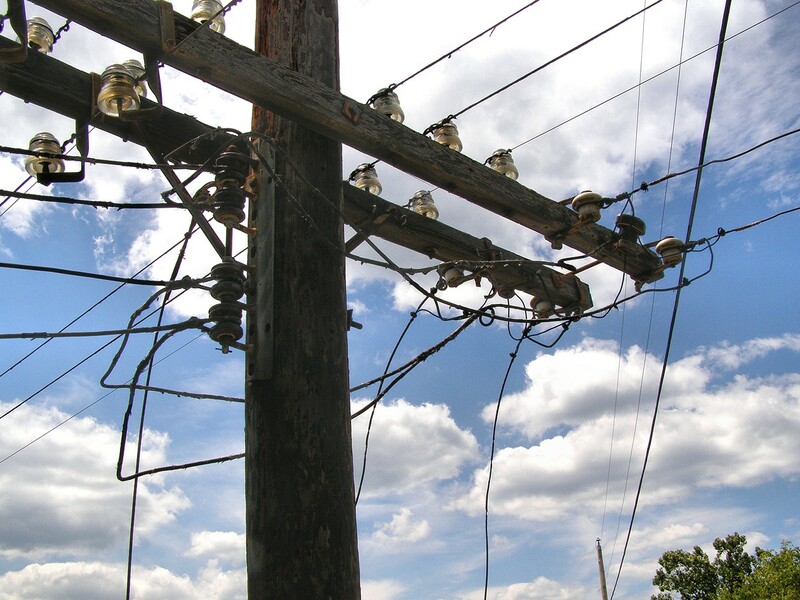 Synonymous with the term "electrical conductor" to this day, copper was generally replaced by aluminum braids in power applications and of course its role in data transmission was tied to the pole line . Ultimately railroads did all they could to get out of the power transmission business, in some cases going as far to replace copper cable with solid state solar panels. 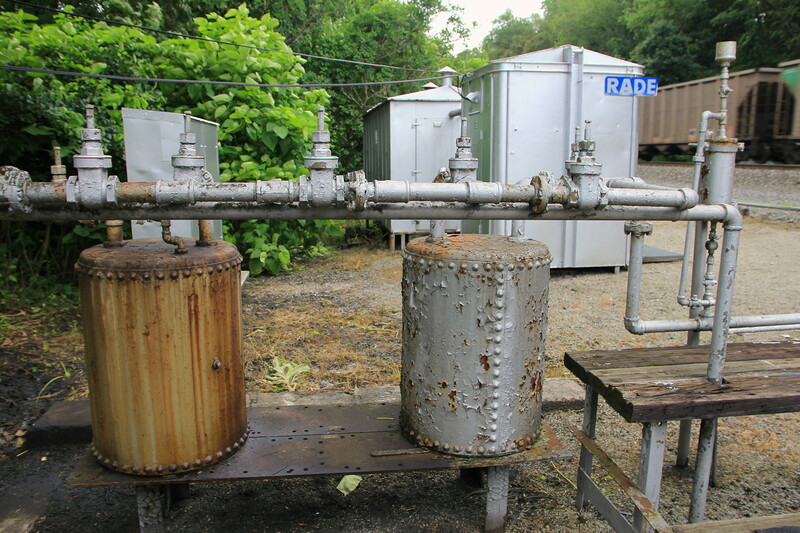 Large ceramic insulators met the same fate as the copper wire when the business of providing signal power was turned over to the local utilities. Outsourcing is the name of the game in the 21st century. 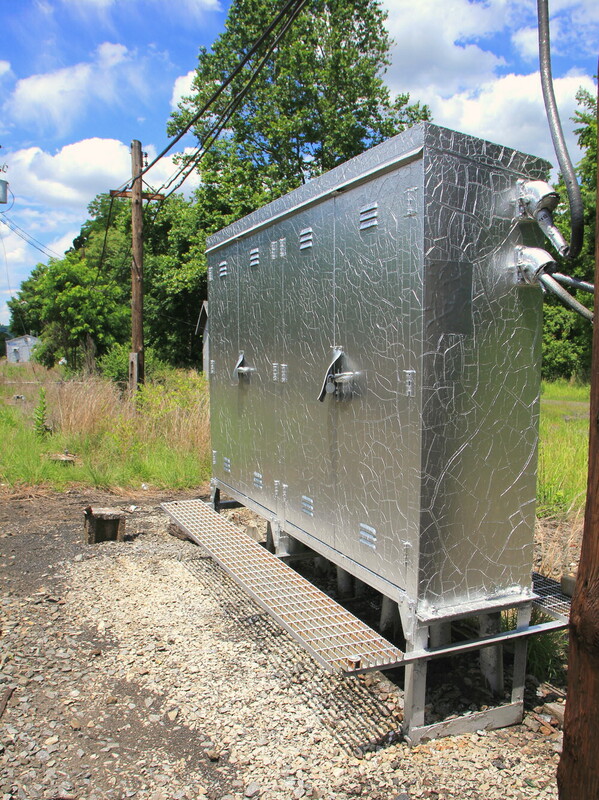 It made no sense for railroads to act as power companies, employing linemen and stocking electrical hardware such as this. PCB's are probably the best class of material for insulating transformers being non-flammable and possessing a high dielectric coefficient. Unfortunately they also cause cancer and persist in the environment almost indefinitely. All the more motivation for railroads to stop running their own power grids. Glass was the insulator of choice for low voltage signal and telegraph wires running along side the power supply lines on the poles. Edging out ceramic in the same use case, the sparking glass insulators made railroad poles a look a bit like Christmas trees. Replaced at first by cheap rubber and plastic models and ultimately by wireless, glass insulators became a staple of country antique shoppes and the preferred target of rural target shooters. More expensive than its pole line cousin, optical glass collected the light from the low wattage signal bulbs and and protected it 1-2 miles down the track for approaching trains to see. Most color light signal lenses consisted of an inner colored glass filter assembly with an outer Fresnel lens that focused the beam. Today these have been replaced by high intensity LED's that often do not need a focusing lens, making do with a cheap clear plastic cover. 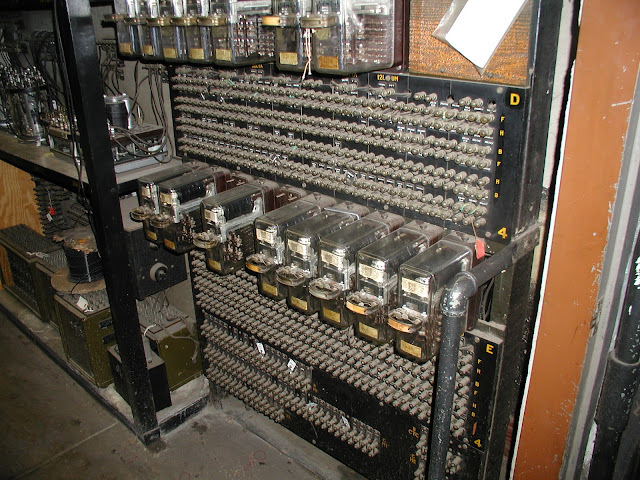 Compressed air was the power source of choice for many early power interlocking installations. Not only were air operated switch machines simple and cheap, it was also easy to safety control the flow of air using low voltage electrical circuits passing through an electro-machanical interlocking machine. Of course air was only cheap as long as the workers needed to keep the lines dry and leak free were also cheap. Today pneumatic switch machines are fading fast in the presence of bullet proof, high voltage electric machines. Silver paint is typically applied to relay huts and cabinets to reflect the sun and keep internal temperatures low. In this case the need for painting has been replaced by corrosion free shiny materials and compact air conditioners. Lead acid batteries were once provided in large quantities for when the railroad supplied power suffered some sort of outage, as was frequently the case in the pole line era. 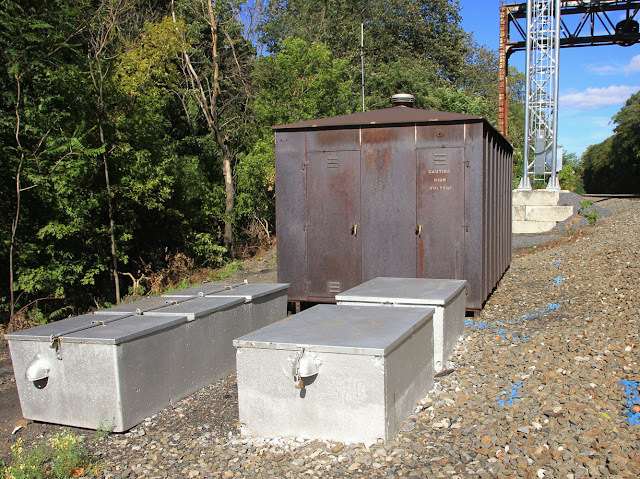 Because the batteries would vent hydrogen gas as they charged and discharged, they were stored in concrete "wells", outside the relay huts where there was no risk of explosion. Today improvements in battery technology and power reliability have made such large bulky backup power arrangements unnecessary. Relays are constructs of copper coils moving silver plated electrical contacts to make and break electrical circuits, all sealed up in a glass envelope. Once the standard unit of electronic logic until the advent of the transistor, the function of relays was duplicated by solid state gizmos such as transistors. Relay logic was standardized across vendors and can't be hacked, but changes are costly and time consuming to implement, making software based alternatives far more attractive. CSX Cumberland Sub MP 130 Auto Signal "Drywall"
Up through the middle of the 20th century railroads were once at the vanguard of technical innovation, leading the way in telecommunications, computing and material science. While today these technologies and materials of yesteryear can make railroads seem like an under-funded anachronism, a different view shows how well the engineering of the past has stood the test of time. While the materials of today are in many ways superior, they lack much of the spirit of what came before. A spirit created by human hands crafting, fitting and maintaining the materials of yesteryear from one century to the next.